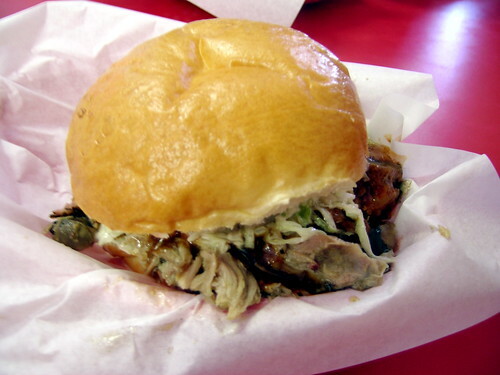 Before there was the sandwich blog, there was The Carolina — Denver's top sandwich. Once upon a time, there was a man named Jabo, who fed the DTC masses from his barbecue cart. So delicious were his smoked meats that the crowds soon overwhelmed Jabo, and forced him into a strip mall on Arapahoe Road, by the motorcycle dealership. Jabo remains there today, serving up his varied meats along with such delicacies as honey-buttered scones (donuts), sweet potato fries and an unmatched variety of exotic sauces. While I quickly acknowledged Jabo's place in the Denver BBQ scene, it took me a while to realize The Carolina's importance. I'd always considered coleslaw to be a side dish — never a topping. Jabo introduced me to slaw's potential and I've never looked back. Coupled with one of Jabo's signature sauces, such as the ever reliable hot mango, or hot mustard, The Carolina is unstoppable. It is THE five-sandy champion to which all sandies, Denver-based or not, aspire to. Bow before The Carolina. I've always wanted to write about The Carolina, but it's a bit too much to capture in words. I've got a picture now, at least, so maybe I'll try again later. This is entirely strange and delicious - maybe even legendary. Please take us here to try all of these strange bbq sauce concoctions . Lucky for me i could stop that unstoppable rapping sensation by closing my ears. Sounds like a Jabo's pilgrimage is in order. It's changed lives. Regas and his wife tried to take his parents to Jabos for dinner and were totally foiled by unpreparedness on Jabos part. I guess they didn't have beef brisket ready and that's what they wanted. I was like...don't get anything but a carolina or a link...there's just no need. "Never pass on a scone!" Z! Thank you for teaching me the ways of Jabo's. It's not the kind of place you can deal with without the proper guidance or introduction. Too bad about Regas and wife. They should have listened to you -- you can't just wing it with Jabo. And we should probably find the "never pass" lady and make a commercial.